Before I went on holiday at the beginning of October, I had a look at my list of "travel items to make". Yes, I have a list for that. I have lists for everything, who doesn't love a good list? One item was bags for used undies. I like to keep them separate in my case and as I always take enough undies for a month (you never know what will happen! OK, I haven't been forced to change my pants mid-day since I was a child, but you never know!) I needed a bag, or two. 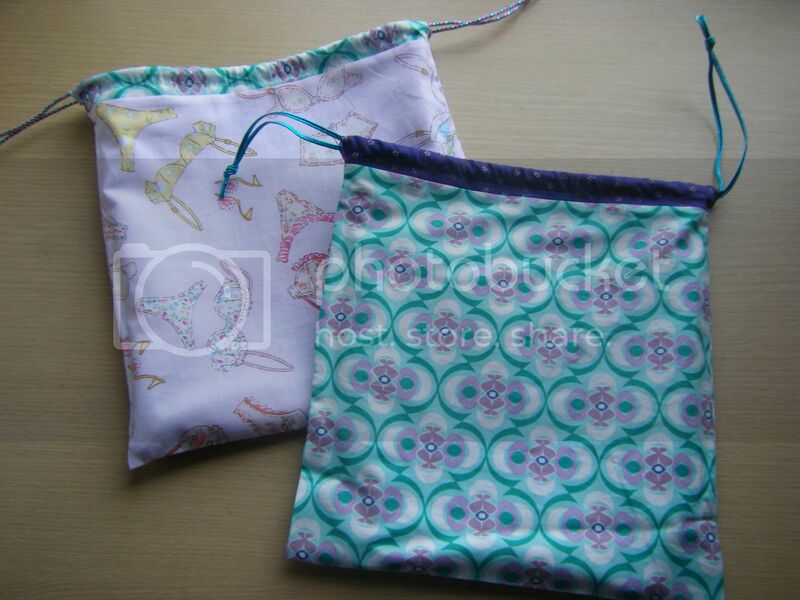 I made simple drawstring bags and I made them reversible. Clean undies when the patterned side is out, dirty undies when the undie-themed fabric is out. 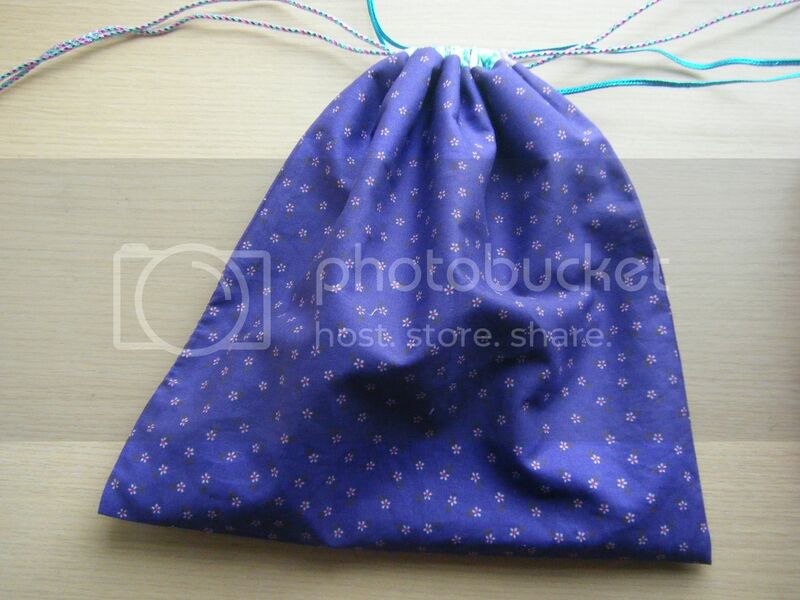 I used the blue and purple fabric as the casing for the purple bag and vice versa. I found some glitzy cord to thread through, though I'm not sure how that will bear up in the wash, I probably need to take it out. They are about 12" square, so plenty of room for one of my mammoth-sized bras along with the smalls (or not-so-smalls in my case). And as you've never seen a draw string bag before, I thought I'd better take photos of them closed so you can see what they'd look like! Do you have a bag for your dirty smalls/not-so-smalls/down-right-huges or is it just me? That's a pretty good idea and I love, love the underwear fabric. I certainly don't have anything as pretty! 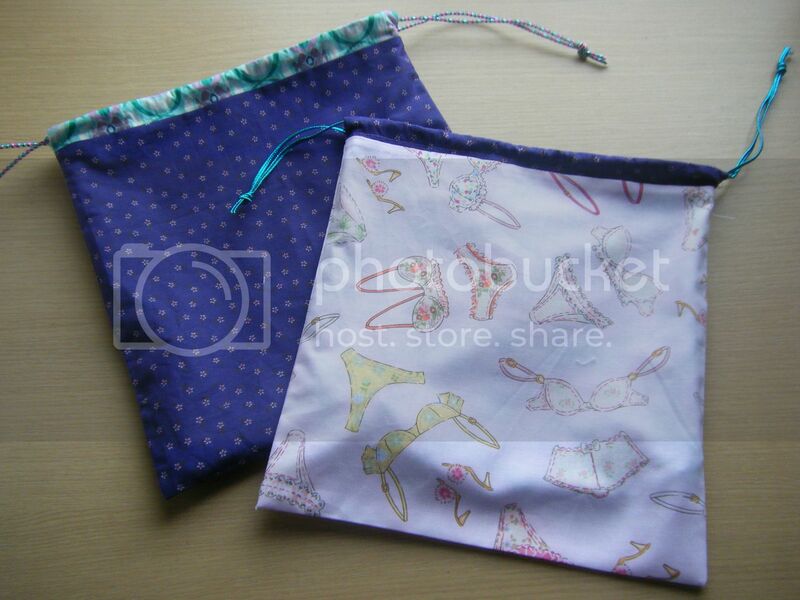 What a fabulous idea, Wendy - the drawstring bag, reversible for clean or dirty. The undies fabric is perfect!!! I had never heard underwear referred to as smalls until I began reading blogs. 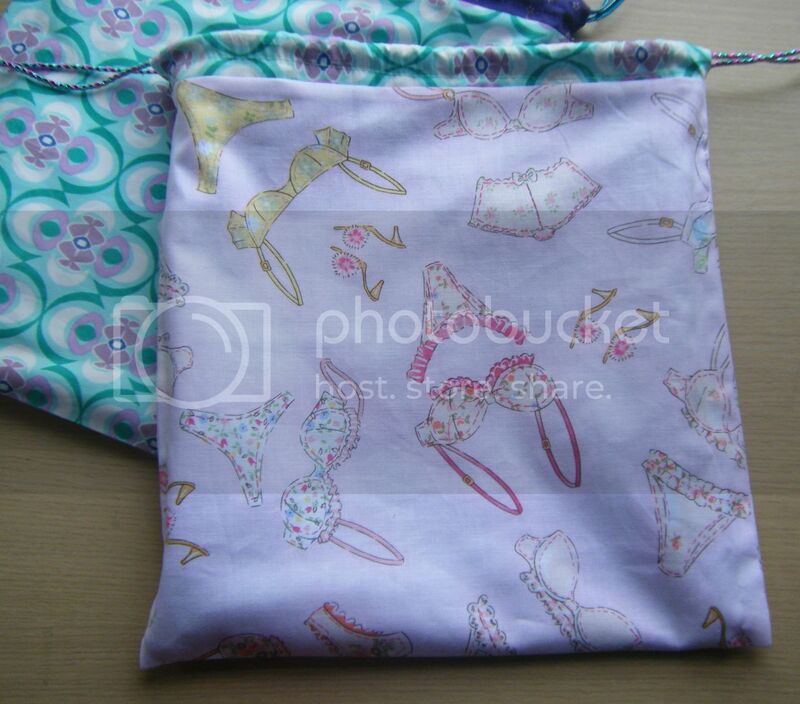 When we travel I take a pillowcase with us, and we put all of our laundry in it, so no, I don't have a bag for my jumbos :D I love the lingerie fabric - I have (or used to have) a fabric with bras printed on it! That's a clever idea. Much prettier than my collection of plastic bags! 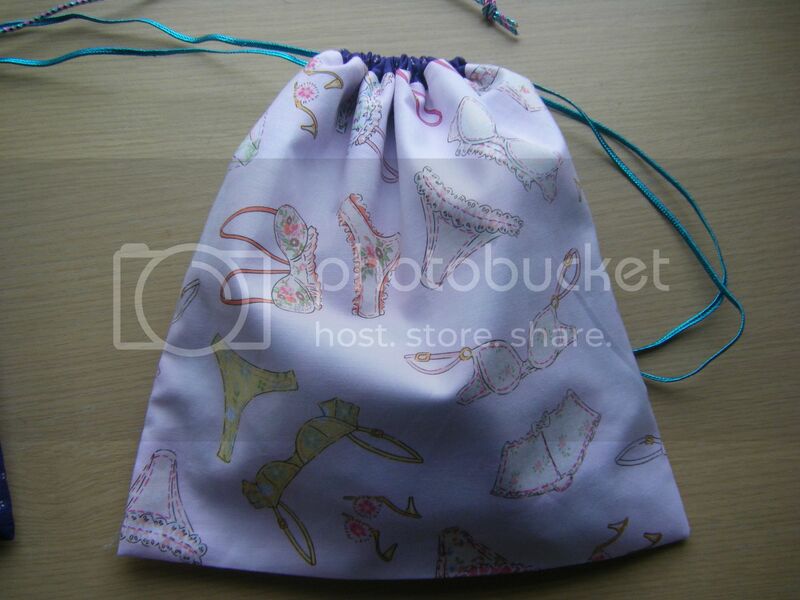 Your drawstring bags for undies are really pretty. I love that undie fabric! We always travel with big drawstring bags for any dirty clothes. I got tired of using plastic grocery bags or those thin plastic bags you find hanging up in hotel room for that purpose. Great fabric and adorable bags. What a super idea! lol - a plastic grocery bag - LOVE this idea of yours, especially the reversible bit. I love how organised you are and what a clever idea :) Love the fabric choices.